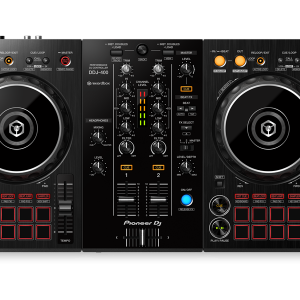 Familiar Layout: Mix audio and videos instinctively with features inherited from the CDJ and DJM series including large jog wheels and multicoloured tactile Performance Pads. The 4-channel controller has an independent sampler section for intuitive control of Beat Sync, quantize and trim on the sampler. High Quality Sound: Hear the true quality of your tracks thanks to AC inlets for reduced cable contact resistance and a high-performance 96 KHz/32 bit D/A converter made by Asahi Kasei. Plus a low-jitter clock IC and the 96 kHz/24 bit USB sound card ensure powerful, high-quality sound. 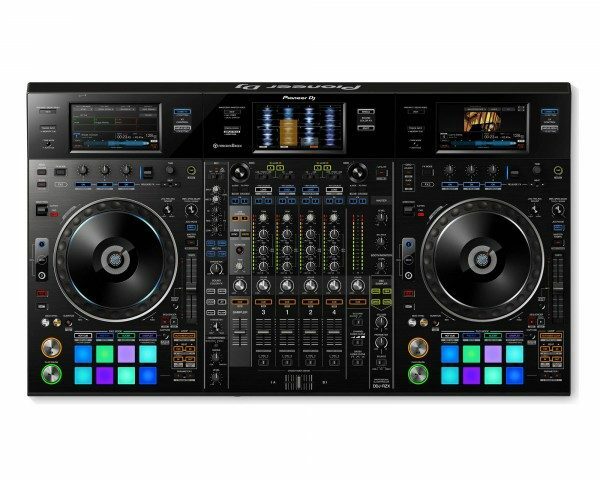 3 Touch Displays: Three 7-inch touch screens give you direct access to track info such as titles, BPM and key using deck display mode, and enlarged waveforms for each track, as well as loops and Hot Cues in mixer display mode. You can use the displays to preview/monitor video and image files, trigger Beat FX and Release FX, while Touch FX lets you add FX and adjust parameters by tracing on the x and y axes on the display. All without having to touch your laptop. Dedicated Mic Section: 2 XLR combo input jacks give distortion-free Mic output even at loud volumes. The dedicated 3-band EQ and Mic FX – Echo, Reverb, Pitch or V-Tune – let you tune each voice to give your performance just that little extra. 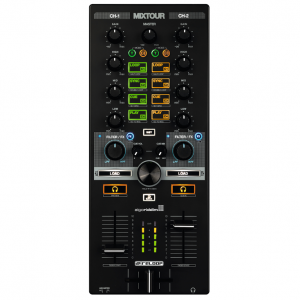 Advanced FX: The DDJ-RZX is stacked with pro-DJ FX controls for rekordbox dj and external sound sources. You can apply Sound Color FX and Beat FX simultaneously, and trigger Release FX to reset them instantly to create a break. Plus you can add sub parameters to the Sound Color FX or use Sampler Repeat to change the length of a loop. rekordbox video: You get a free licence key for rekordbox video bundled with this controller. Use it to load videos and image files to the decks from a laptop or stream live footage from a USB camera, then add text overlays and FX in real-time. You have the option to prepare your video sets in rekordbox or mix your visuals on the fly. Sound Color FX: You can add sub parameters to the Sound Color FX – Space, Dub Echo, Crush, Jet, Pitch, Filter – or use Sampler Repeat to change the length of a loop. OSC Sampler: Use the oscillator sampler to overlay 4 pre-set sounds – Noise, Sine, Siren and Horn – and modulate the output using the dial. The sampler also gives you the freedom to trigger and manipulate your own samples loaded to the banks in rekordbox dj. Active Censor: Intuitively control the Active Censor feature in rekordbox dj. Set in and out points and apply Reverse Roll, Trans, Echo or Vinyl Brake FX to disguise explicit words in tracks. The FX will then be heard whenever the track is played from rekodbox dj. 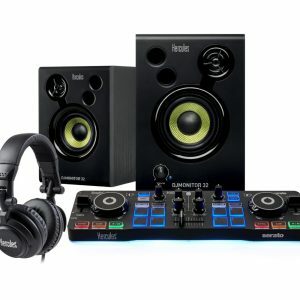 Dual USB ports: 2 USB sound cards and ports mean you can hook-up 2 computers at the same time and use the top-loaded A/B switch for seamless DJ transitions. 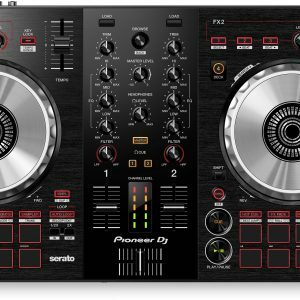 Durable design: This controller comes with a brushed aluminium top plate for a professional feel, a newly developed crossfader for smooth control over long-term use, and P-LOCK Fader Caps to prevent the fader knobs from dropping. Robust crossfader: Pioneer DJ’s newly developed crossfader is highly durable and capable of over 10 million movements. 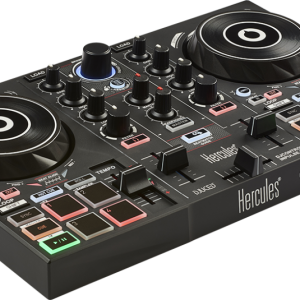 rekordbox dj: You get a free rekordbox dj licence key bundled with this controller. 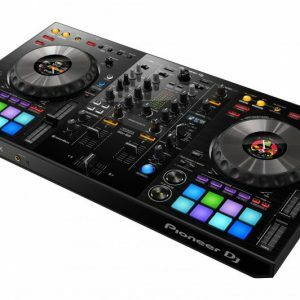 Simply activate your licence key, connect the controller and start DJing. rekordbox dvs: You also get a free licence key for rekordbox dvs included in the box, giving you highly responsive scratch control with music from your rekordbox library.